You may have noticed that Abbott and other members of the front bench regularly throw around numbers and statistics to back up what they’re saying. Numbers and statistics are quantifiable, so when they are used, they make the speaker sound like they know what they’re talking about. But exactly how reliable are they? Of course we know that Abbott often contradicts himself – sometimes within the space of as little as half an hour – regularly choosing truthiness over truth. But exactly what is the ratio of truth to truthiness? How much can we rely on what Abbott tells us? I decided to take a quick look at Abbott’s most recent interview – which was just a short one in Hobart yesterday – to examine the ratio of truth to truthiness. In that interview, Abbott made one quick statement and took only two questions. All up it was no more than half a page of text when typed. But he managed to include quite a few numerical or ‘statistical’ claims. Abbott isn’t the only one who has been throwing this piece of truthiness around. Minister for saying “We’ve-stopped-the-Boats” Peter Dutton put out a press release on Friday with the same information. And Andrew Robb repeated it again this morning on the ABC’s Insiders programme. As I explained yesterday however, the claim they are making is true if you only look at one small subset (3.1%) of resettled refugees – those resettled by the UN. If you look at all resettled and recognised refugees – the full 100%, which includes refugees who have applied directly to a specific country rather than through the UN – then we are actually 27th on a per capita basis globally. According to the Refugee Council of Australia – this is a far more accurate measure. And if you look at how many refugees we take overall – and not just those who are resettled – well, we don’t even rank – not anywhere meaningful anyway. According to Abbott, thanks to the Liberal Government’s strategy – and particularly their small business policies, business confidence is high. 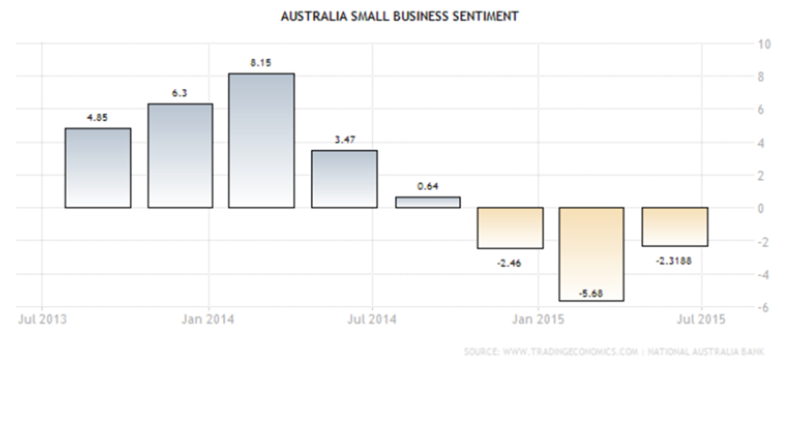 But according to the NAB monthly survey of business confidence (shown below) as tracked on the global TradingEconomics site – business confidence has been trending steadily downwards since the Abbott government took office. Now, to be fair – it is not at an all-time low – but it certainly cannot be considered high. Treasurer Joe Hockey made a similar claim a few week’s back in question time, saying that the coalition had created 334,000 new jobs since taking office. It was not true then and it is no truer now. In July 2015, there were 11,810,700 employed people. That’s an increase of 164,900 jobs. Not 335,000. It’s possible that the larger number only takes into account new jobs that are created, and fails to factor in jobs that are lost or where people change jobs. But either way, it’s misleading, and does not present an accurate picture of how the employment situation has changed under the Abbott government. Further, as Kaye points out in her article – since Abbott and co took government, the number of people employed has increased by 7,495 jobs per month (on average). However under Labor, the number of people employed increased by 15,180 jobs per month (on average) – and that was over the Global Financial Crisis. According to the ABS, there were 1,127, 552 new car sales in the year ending 30 June 2015. Despite Abbot’s claim, this was not a record year. In fact, the record for new car sales was set in the twelve months to June 2013 – just before Abbott and Co took the reins of government – when 1,141,500 new car sales were sold. Even looking at individual months – instead of whole years – the biggest month was in September 2012, when 97,965 new cars were sold, followed by June 2013, when there were 96,766 new car sales. Both of these months were prior to Abbott and co taking office. In absolute terms, Abbott is actually right about this. In the year to 30 June 2015, according to the ABS, there were a record 219,921 new dwellings approved. But this is a meaningless number unless you factor in our current population. Our population grows every year, and therfore so does our need for housing. Once you factor in our current population, and you look at the number of new dwellings approved on a per capita basis, then the record over the last 35 years was set in the 12 month period to June 1989, when 11.13 new dwellings were approved for each 1,000 people living in Australia at the time. This compares to only 9.23 new dwellings approved for each 1,000 people living in Australia for the year ending 30 June 2015 (which ranks only 9th in the 35 year period). In absolute terms, again Abbott is right – the number of company registrations is at record levels. But again the number of companies tends to be tied to the size of our population. And just like our population, the number of companies registered has increased every year this century – even during the global financial crisis. What is more relevant is looking at the level of growth in new business registrations from one year to the next. When looked at from that angle, it is the year to 30 June 2007 that has the highest growth rate – at 6.2%. That said, the year to 30 June 2015 has the second highest growth rate, at 6.0%, so Abbott is not completely out of the ballpark. 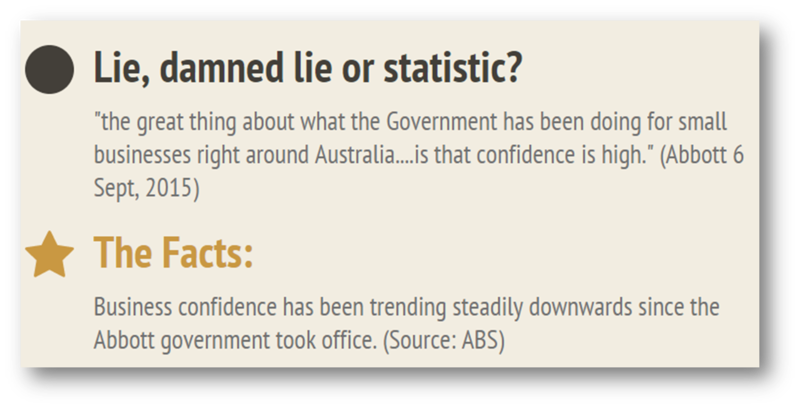 During his brief interaction with the press yesterday, Abbott made two other ‘factual’ claims…. Abbott stated yesterday that “we made a decision last year that we would take about 4,400 people from Northern Iraq and Eastern Syria”. I’m not going to question the veracity of that decision – but what I am going to question is that it suggests that they made a decision to increase Australia’s total intake of refugees. This is not true. In fact one of the first things the Abbott government did after coming into office, was to drop the total number of refugees Australia is taking by 30% from just over 20,000 refugees per year to just 13,750 a year (or less than 0.1% of the world’s current refugees). This number has not increased since then, although there is talk of potentially increasing it in 2017/2018. So if we have taken more refugees from Iraq and Syria, it has arguably been at the expense of refugees from South-East Asia – which has the largest share of refugees globally. The final statistical claim that Abbott made was that “we have got bankruptcies at record lows“. I’m going to stay on the fence on this one. Certainly according to ASIC data shown on TradingEconomics, the number of bankruptcies has continued to grow – as is seen below. But since the number of companies has continued to grow as well – and the rates of growth are fairly similar, I’m going to fence-sit. There was not a single statistic that Abbott used yesterday which isn’t ‘on the snout’ in one way or another. Not one of his claims stands up to scrutiny without having a bit of credibility knocked out of it. Many of them ‘stretch’ the truth, by making the truth appear to be something that it isn’t. But not one of them stands alone as an accurate and clearly verifiable reflection of the truth. I suspect there’s a good chance that you’re not surprised by this. And here’s the problem with that…. When I started looking at each of Abbott’s ‘statistical’ claims, I wasn’t expecting to find that pretty much every single one of them was at best misrepresenting the truth with statistics and at worst, an outright lie. I know we are all conditioned now to be skeptical of politicians’ claims. But when it’s not possible to clearly verify one single piece of factual information that comes out of our Prime Minister’s mouth in one very short door-stop interview – you have to think that things have gone too far. You have to wonder whether our tolerance for politicians’ stretching the truth is just too high now – that we have become so desensitised to politicians lying, that we just don’t blink anymore. Without accurate information, we can’t make educated and informed judgments about those who govern us and those who would govern us. It’s as simple as that. Politicians’ lies should be picked up by the media. But unfortunately, large portions of our media are just taking our politicians’ claims as factual without checking their sources. There was a great example of this on twitter last Thursday, when Miranda Devine – of Daily Terrorgraph fame – tweeted back at people who were trying to explain to her that Australia does not take the highest number of refugees per capita. 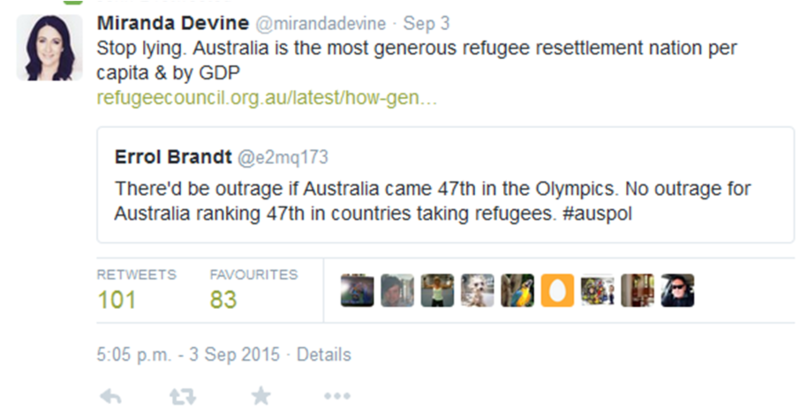 In her tweet – shown on the right – Devine actually provides a link to the Refugee Council of Australia’s page which explicitly states that Australia is 27th in the world in regards to its refugee per capita intake. Clearly Devine didn’t even bother to read her own link. Since originally publishing this article, the ABS have released job numbers for August which also include ‘rebenchmarked data’ back to 2011, which drops the number of employed people in September 2013 by a significant number. They had apparently made an error in the previous numbers following on from a delay in processing passenger cards by the Department of Immigration. If this is correct – and I say ‘if’ because it’s a massive error if it is one – then this reduces the number of employed people in September 2013 to 11,452,500. Interestingly, the ABS’s link to their released data for the same date, still shows the higher number. If you do accept the lower number, there are now 312,900 more people employed using the August numbers – than there were in September 2013. This is still lower than Abbott’s claimed 350,000, and at the time Abbott made his claim, the number was actually under 300,000 – but it is closer to the mark than the previous ABS numbers suggested. But since these conveniently ‘adjusted’ ABS numbers still warrant further investigation, stay tuned…….